Nearly all of the biggest names in media and technology descended on Sun Valley, Idaho, July 11-16, and in the mix this year were trucking networks, spider silk and quantum physics. Each year, the exclusive conference, famous for its deal-making and tycoon crowd, spotlights a handful of young companies. The three startups set to present are tackling problems far afield from the work of the television and film moguls strolling the resort: Convoy Inc. makes trucking software; Bolt Threads Inc. makes bio-engineered fabrics and Rigetti Computing is building a quantum computer. The firms confirmed their participation but declined to comment further. The sessions at the conference, hosted by investment bank Allen & Co., are off the record. Yet, the chosen startups fit what was described by attendees as a consistent theme at the conference: artificial intelligence and its possibilities. All three also demonstrate the tech industry’s attempt to use cutting-edge research in other industries — and the sector’s growing influence at the yearly confab. 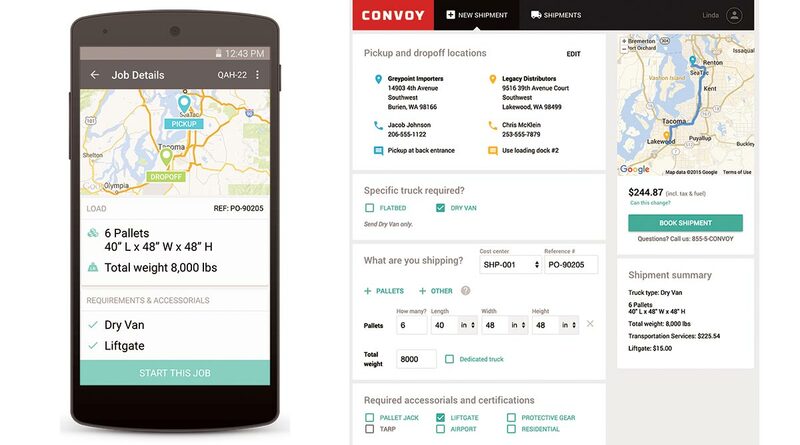 Convoy, a 2017 newcomer, is based in Seattle and has been called an “Uber for trucking.” The company matches logistics companies with drivers through an app, like Uber, but is also working on automating much of the back-end paperwork and logistics in the multi-billion dollar industry. Reid Hoffman — LinkedIn founder and Silicon Valley statesman, is on the board. Convoy signed a deal with Unilever NV last year. It got a new competitor, too, when Uber started a freight service. AI, a fixation for the tech giants that use it in image-recognition and voice-based gadgets, is overflowing into other fields, like cloud-computing, finance and health. It’s also drawing interest from the media and advertising executives that make the annual Sun Valley trek. Entering the conference early July 13, Hoffman chatted with Martin Sorrell, chief of ad giant WPP Plc, about bots. Tim Armstrong, head of Oath, the new media arm of Verizon Communications Inc., mentioned his firm’s work on machine learning, a branch of AI in which rivals Google and Facebook Inc. have invested deeply. “I’m really bullish on the machine learning side of where we’re heading and where the industry is heading,” Armstrong said. In prior years, the startup showcase, called the “New Breed” session, has highlighted firms that heralded big new areas of growth in media and technology. Online video service YouTube made its debut there in 2006, a few months before Google bought it. Five years ago, Travis Kalanick wowed Sun Valley with his ride-hailing app called Uber. Rigetti also competes with larger companies. The startup is on an ambitious quest to create quantum machines that can out-muscle existing supercomputers, a still unproven technology that could revolutionize energy markets, medicine and finance. IBM, Google, Microsoft Corp and Intel Corp. have invested in quantum computing research as well. Bolt Threads has a very different mission. The San Francisco-based company creates textiles from synthetic spider silk, a process it says is more environmentally friendly. That’s a big departure from the media businesses analyzed during closed-door meetings at the conference. But the startup’s first product, a $314 tie, suits the Sun Valley audience, some of whom donned sneakers that cost as much or more. And fashion has long had a seat at the event. Famed designer Diane von Furstenberg, a regular, once modeled Google Glass at the event. Fashion, of course, moves fast. “Google Glass is dead,” she replied to a reporter’s question at this year’s event.